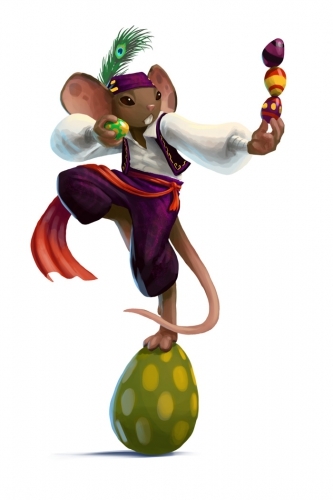 The Eggsquisite Entertainer Mouse is an Event Mouse found during the annual Spring Egg Hunt event. Cheese: See current Spring Egg Hunt location Charm: ?? "Watch and be amazed! Be mystified! The great Eggsquisite Entertainer will eggscite you with his performance focused around and consisting eggsclusively of eggs! Training for an entire lifetime waiting for the Spring Egg Hunt to finally put on the show of your egg-loving life! ""Eggs?! Who said anything about eggs!?""" Information on how to locate and capture the Eggsquisite Entertainer Mouse can be found on the current Spring Egg Hunt event page. 11 April 2017: The Eggsquisite Entertainer Mouse was released as part of the Spring Egg Hunt 2017 celebration. This page was last edited on 17 April 2017, at 19:48.